Duvet cover (Queen Size) measures 88x88 inches Image size of 83 x 55 3/8 inches Premium polyester microfiber creates an ultra soft and luxurious feel Hidden zipper closure, interior ties to attach comforter to duvet cover Image is printed on one side 100% Made in the USA! Lantern Press is a dynamic art company that specializes in the world's leading imagery. Our collection includes original works created by our in-house art team, modern photography, home & office decor trends, antique maps, vintage posters, and everything in between. With an ever growing collection of world-renowned imagery, Lantern Press is a trendsetter known to decorate homes and major resorts - as well as the sets of commercials, films, and television shows. If you're seeking the perfect art to frame for your home or office, we're certain we have a piece you will connect with. Peruse our collection here featuring over 50,000 images available in multiple sizes and mediums. We'd also like to take this time to thank you if you've purchased from us before, or plan to today. You are supporting artists who care deeply about their art form, and a company that is proud to print these amazing images in America. Your support allows us to continue doing what we love - creating beautiful art. 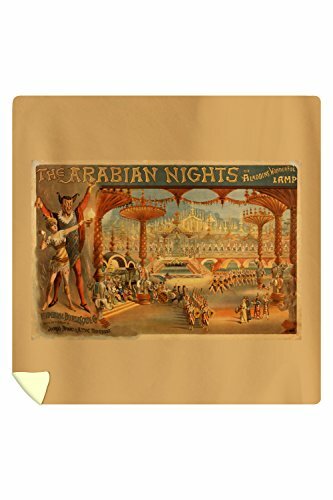 Society6 Arabian Nights Duvet Covers Twin XL: 68" x 92"
Society6 Arabian Dance Duvet Covers Twin XL: 68" x 92"